since 1978. Triad fish are caught using slow hook-and-line method to minimize stress, processed immediately on-board, and frozen within 90 minutes. Each fish is then individually hand dipped in fresh seawater to create a protective glaze and tagged to ensure each fish is traceable to the source. 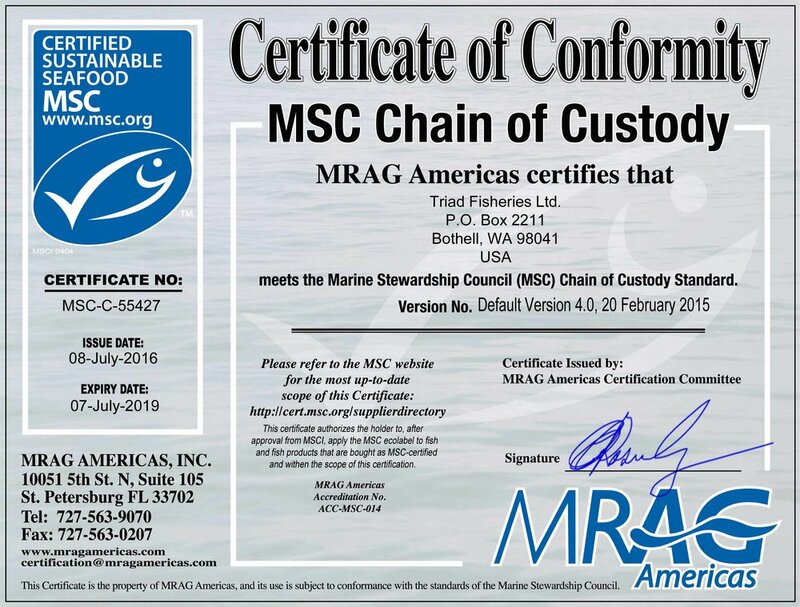 Mark and Beth Tupper purchased Triad Fisheries Ltd from Bruce Gore in 2008; currently working with thirteen Frozen at Sea, troll boats in SE Alaska. Triad Fisheries markets internationally to Asia and Europe along with US domestic sales. Mark Tupper started in the seafood business in 1976, (while still in high school), working at the premier salmon smoker, Port Chatham in Seattle WA. Then he worked at Icicle Seafood’s for seven years onboard the P/V Bering Star as Production Manager in Alaska. He has held positions at Orca Bay Foods in Seattle for ten years as Plant Manager, Buyer, Retail Sales Manager and National Sales Manager. Built private label frozen seafood portions for Whole Food Markets, Target and Topco. Elizabeth (Beth) Tupper, has a Food Science Degree from the University of Wisconsin-Madison. Elizabeth entered the seafood industry working in Alaska days after graduating and has been involved with the Seafood Industry for the past 36 years, working at Icicle Seafood, Farwest Fisheries and Trident Seafoods. Triad Fisheries is a family business, their two adult children are also involved in the business.